The final pick in today’s 2018 PopCult Gift Guide is a trading card set that I have grown quite fond of this year. 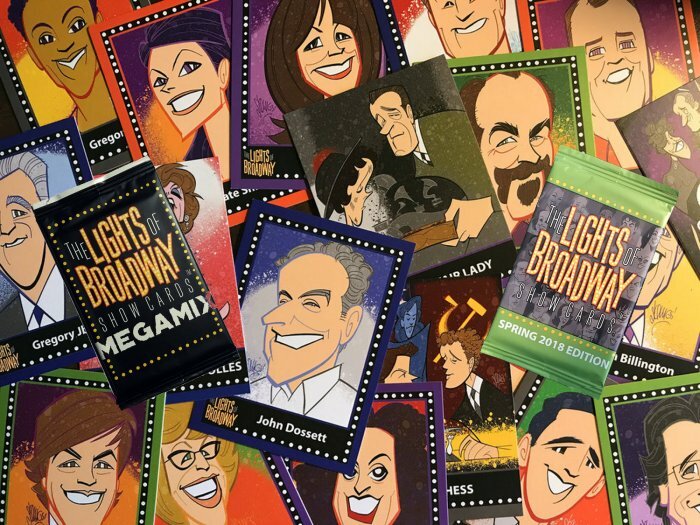 The Lights of Broadway Show Cards feature the artwork of Broadway’s reigning caricaturist, Squiggs, and present the stars, theaters and shows of The Great White Way in trading card form. 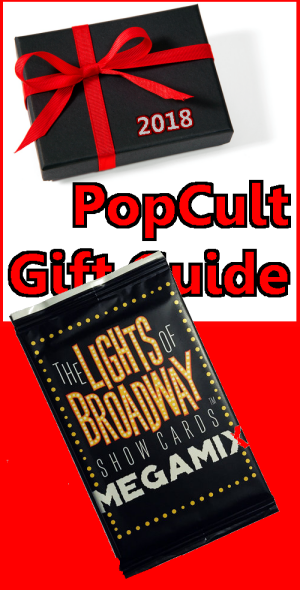 This is the absolutely perfect gift for the theatre fanatic on your holiday shopping list. The Lights of Broadway Show Cards celebrate Broadway theatre. The stories and the storytellers, the art and the artisans, those who make it all possible and the community embracing it. Shows, actors, directors, writers, designers, and all else in the spotlight or behind the scenes who keep the theatrical world spinning. This is the first time I’ve ever included something in The PopCult Gift Guide that I’ve also written about for Non Sport Update, but my editor said it was okay to spread the word on this cool card set, so I’m including it here. You can read more on the subject, including my interview with Justin “Squigs” Robertson himself, in the next issue of Non Sport Update, on sale in two weeks. The reason that the timing is perfect to tell you about these cards now is that, next week they will start taking pre-orders on their next series of cards, Autumn 2018, but right now they are running a sale and you can find all sorts of great items at 20% off their normal price. Over at The Lights of Broadway website, you’ll find special deals where you can get packs of their Spring 2018 and MegaMix cards for the discounted price. You’ll also find deals on binders and starter kits (which include an illustrated binder and several packs of cards). If you want to go whole hog, you can find entire boxes of 36 packs, to shower your theatre fanatic with loads of great cards. You can even find single-show packs for Fiddler on The Roof, Fun Home and Dear Evan Hansen. They have everything from stocking stuffers to mid-sized gifts to BIG TICKET items. The cards are beautifully printed and feature the amazing art of Squiggs. If you’ve got a theatre kid on your gift list, this is where you need to go. You can order directly from The Lights of Broadway Show Cards website, or go to New York and look for them in Schubert Alley and The Drama Bookstore.